Hair Featural: Lightweight, Not Rough, No Smell, Smooth, Tight, Compact, Very Soft, Not Easy To Separate. Advantage: Follow the fashion trend, Try new styles, Show your own beauty so easy. Feeling Like Goddess, Looking Like a Queen. 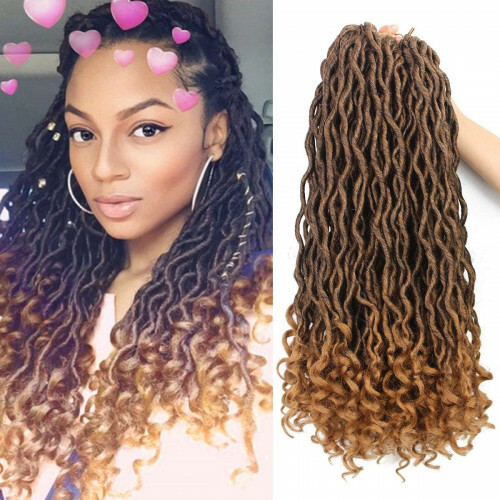 Beautiful Hair And Look Natural, Easy To Install, Factory Direct, factory Price, Great quality hair, Come With Free Gift Crochet Needle or Rings. Fast delivery: Shipping by Amazon(FBA), usually 1-3 working days delivery. 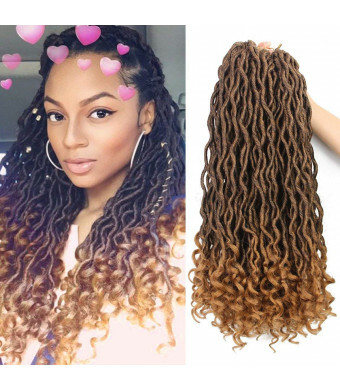 Hair Name: Curly Faux Locx Crochet Hair with High Quality.The tail of graceful modelling, reveal individuality. Follow the fashion trend, Try new styles, Show your own beauty so easy. Hair Details: 18 inches, Stretched Length: 20 Inch. 70g/pack. Total 420g. Super light and very comfortable to wear. Hair Colors: We provide 1B, 27#, T1B/27 on Amazon. Process: Handmade through 35 working procedures. Perfect Hair with Fiber.